(you must have a blog to enter & be 18 years or older) (this Giveaway is now worldwide - EXCEPT for the "Cork Earrings" prize. Due to postage prices - if the winner does not live in the lower 48 of the USA then the "Cork Earrings" become a second place prize) TOTAL PRIZE PACK VALUED AT $115!!! - 1 Ad Space on A Peek Into My Paradise for 30 days - $30 value - 1 Medium Ad Space on Cuddlebug Cuties - $5 value - 1 Thirty Day Ad Space on H2O Bungalow - $15 value - 1 Sidebar Ad Space on Heidi's Wanderings - $10 value - 1 Bottom of Post Ad Space for 1 month on Sew Crafty Angel - $20 value - 1 Month Ad Space on God's Growing Garden - $15 value - gorgeous Pink flower Cork Earrings by Crystal Make It Easy Crafts - $20 value THERE ARE MANY WAYS TO ENTER! - a shipping address will be requested should you win the earrings. By participating in this blog hop your understand that your link might be promoted on social media. Also, by participating in this blog hop your email address will be added to our CLIMB list & you will be sent an email reminder next month. Networking means helping each other grow!! 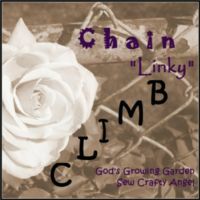 If you want to promote a CLIMB link then use #ChainLinkyCLIMB on Twitter or Google+ so that we can all help each other grow! Chris has been in the kitchen since she was tall enough to see over the counter. Her scrumptious blog is full of amazing recipes & tips. Thank you so much for hodting the party, I so appreciate it. God is Light - Cure for Cabin Fever of the Soul! Prayer Warrior #3 - "Even a Hamster"
"Get Creative Giveaway" by "Katherine's Corner"
MARCH 2014 Chain "Linky" CLIMB & Giveaway!